Objectives We assessed the evidence from reviews and meta-analyses of randomised clinical trials on the effects of pharmacological prevention and management of delirium in intensive care unit (ICU) patients. Methods We searched for reviews in July 2017 in: Cochrane Library, MEDLINE, Embase, Science Citation Index, BIOSIS Previews, CINAHL and LILACS. We assessed whether reviews were systematic according to Preferred Reporting Items for Systematic Reviews and Meta-Analyses (PRISMA) and assessed the methodological quality using ROBIS. Outcome measures Primary outcomes: all-cause mortality, serious adverse events, prevention of delirium and management of delirium. Secondary outcomes: quality of life; non-serious adverse events and cognitive function. Results We included 378 reviews: 369 narrative reviews, eight semisystematic reviews which failed on a maximum of two arbitrary PRISMA criteria and one systematic review fulfilling all 27 PRISMA criteria. For the prevention of delirium, we identified the one systematic review and eight semisystematic reviews all assessing the effects of alpha-2-agonists. None found evidence of a reduction of mortality (systematic review RR 0.99, 95% CI 0.79 to 1.24). The systematic review and three semisystematic reviews found no evidence of an effect for the prevention of delirium (systematic review RR 0.85, 0.63 to 1.14). Conversely, four semisystematic reviews found a beneficial effect. Serious adverse events, quality of life, non-serious adverse events and cognitive function were not assessed. We did not identify any systematic or semisystematic reviews addressing other pharmacological interventions for the prevention of delirium. For the management of manifest delirium, we did not identify any systematic or semisystematic review assessing any pharmacological agents. Conclusion Based on systematic reviews, the evidence for the use of pharmacological interventions for prevention or management of delirium is poor or sparse. A systematic review with low risk of bias assessing the effects of pharmacological prevention of delirium and management of manifest delirium in ICU patients is urgently needed. We used a transparent and systematic method which followed widely accepted methodological standards. We conducted a thorough and comprehensive literature search. Preferred Reporting Items for Systematic Reviews and Meta-Analyses was chosen as the gold standard for defining a systematic review. We did not search for individual trials or performed meta-analyses and Trial Sequential Analysis within each of the groups of pharmacological agents. The objective of this overview of reviews was to systematically and critically assess the quantity and the quality of the available reviews and meta-analyses of randomised clinical trials on the effects of pharmacological prevention and management of delirium in ICU patients. We defined adult ICU patients as those treated in an ICU (or similar terms defined by the review authors) of any specialty, for example, medical, surgical, trauma, cardiac. We included reviews of ICU patients aged 18 years or older and included both acute surgery patients and elective cardiac surgery patients. We excluded reviews on ICU patients with delirium caused by alcohol withdrawal, terminally ill patients, patients admitted to emergency departments and elective surgery patients, except cardiac surgery. We searched the Cochrane Library, MEDLINE (OvidSP), Embase (OvidSP), Science Citation Index-Expanded (Web of Science), BIOSIS Previews (Web of Science), Cumulative Index to Nursing & Allied Health Literature (CINAHL), Latin American Caribbean Health Sciences Literature (LILACS) and Allied and Complementary Medicine Database (AMED) in July 2017, in order to identify reviews eligible for inclusion. Full search strategies and time spans of the searches are provided in electronic supplementary material—ESM. 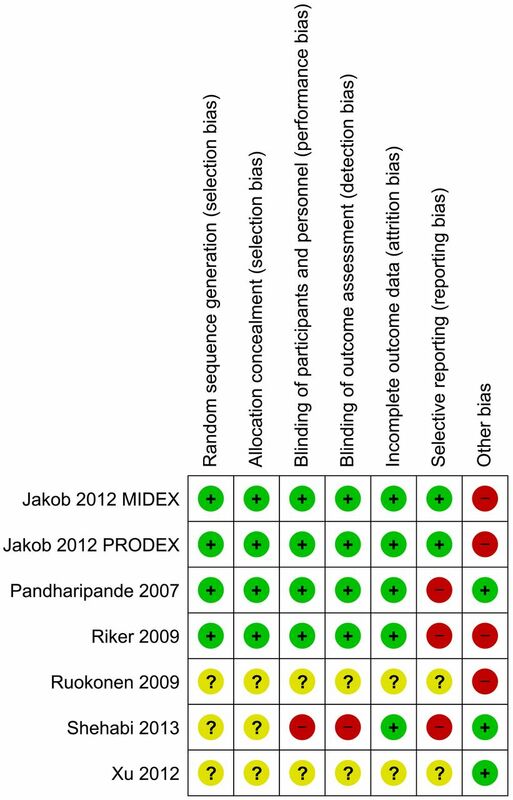 Four authors (MB, SRK, MOC, LKL) independently screened the titles and abstracts of all reports identified in the searches using Covidence and comparison was made within pairs.43 Reports deemed potentially relevant by any of the review authors were obtained in full text, and the full-text papers were assessed for eligibility by two review authors independently before being assessed for inclusion and compared within pairs. Disagreements were resolved by consensus. Reviews containing a methods section and/or a literature search were hereafter checked against the PRISMA criteria.39 Initially, it was our intention to only include systematic reviews fulfilling all 27 PRISMA criteria, but we decided pragmatically to define a group of reviews which failed on a maximum of two arbitrary PRISMA criteria as semisystematic reviews. Four authors (MB, SRK, MOC, LKL) independently extracted predefined data of the included reviews using a data extraction form (supplementary material), which was specifically designed and piloted by the review team, and comparisons were made in pairs. In addition, for all included reviews and meta-analyses, we extracted information on whether haloperidol was recommended for the management of delirium registered as either ‘Yes/No/Not stated’. Disagreements concerning the extracted data were discussed and decision reached between the authors. We a priori36 planned to perform meta-analysis and trial sequential analysis45 of the trials with overall low risk of bias. However, as we solely identified trials with overall high risk of bias, we did not perform the analyses. For the systematic reviews assessed to be of low risk of bias, two authors (MB, MOC) independently assessed the methodological quality of each included trial with the Cochrane risk of bias tool.37 Disagreements were discussed, and agreement was reached between the authors. Results are presented narratively by the indication for use (prevention or/and management), followed by the type of pharmacological agent and the type of outcome. Patients and the public were not involved in this research. We identified 5036 potentially relevant references and finally included 378 reviews (figure 1). Preferred reporting items for systematic reviews and meta-analyses flowchart. We only identified one systematic review46 fulfilling all 27 PRISMA criteria (ESM table 2), eight semisystematic reviews47–54 failing on a maximum of two PRISMA criteria and 369 narrative reviews. Chen et al 46 assessed the safety and efficacy of alpha-2 agonists for sedation, compared with traditional sedatives, in mechanically ventilated critically ill patients. This review included seven trials randomising 1624 participants. All included trials investigated adults and compared dexmedetomidine with traditional sedatives (propofol, midazolam or lorazepam). Tan et al 53 assessed the effects of using dexmedetomidine as a sedative and analgesic agent compared with placebo or alternative sedative agents, such as propofol and benzodiazepines, in critically ill patients; 24 randomised trials, involving 2419 patients, were included. Lin et al 51 assessed the effects of using dexmedetomidine compared with alternative sedative agents following cardiac surgery; five randomised trials and six observational studies were included. We report on a subgroup analysis including five randomised trials and a prospective descriptive study. Fraser et al 52 reviewed benzodiazepine compared with non-benzodiazepine (four randomised trials with dexmedetomidine and two with propofol) regimens in mechanically ventilated ICU patients. Six randomised trials, involving 1225 patients, were included. Xia et al 47 assessed the influence of dexmedetomidine and propofol on adult ICU sedation. Ten randomised trials, involving 1202 participants, were included. Zhang et al 48 included all postoperative trials reporting on delirium risk. We report on only one comparison, alpha-2-adrenoreceptor agonists compared with other sedatives for the risk of postoperative delirium, where only cardiac surgical trials have been included, as the other outcomes included patient groups we excluded (two randomised trials on dexmedetomidine and one on clonidine, involving 445 patients). Pasin et al 50 compared dexmedetomidine with any comparator in the ICU setting (nine randomised trials in ICU, four in cardiac surgery and one in cervical spine surgery, including a total of 3029 patients). Tran et al 54 assessed alpha-2 agonists (all trials reported on dexmedetomidine) for non-procedural sedation in critically ill brain-injured patients on mechanical ventilation. Both randomised trials and observational studies were included. Six randomised trials including a total of 318 patients were included. However, due to lack of clinical homogeneity of the randomised trials and studies, pooling was deemed inappropriate. We only report on outcomes which were defined a priori. Liu et al 49 compared the effects of dexmedetomidine and propofol sedation in adult patients after cardiac surgery; eight randomised trials involving 969 patients were included. We assessed the systematic review by Chen et al 46 as overall low risk of bias (table 1). However, the seven included trials55–60 were all overall high risk of bias (figure 2). The eight semisystematic reviews failing on a maximum of two arbitrary PRISMA criteria, by Tan et al,53 Lin et al,51 Fraser et al,52 Xia et al,47 Zhang et al,48 Pasin,50 Tran54 and Liu et al,49 were all overall high risk of bias. All 46 trials included in these eight semisystematic reviews were overall high risk of bias. Risk of bias summary: review authors’ judgements about each risk of bias item for each included trial in the only included systematic review (Chen 2015). We did not identify any systematic review or semisystematic review assessing the effects of antipsychotics (eg, haloperidol) for the prevention of delirium. When assessing mortality (table 2), Chen et al 46 did not find evidence for a difference when comparing dexmedetomidine with traditional sedatives (midazolam, lorazepam or propofol). Neither did Tan et al 53 and Lin et al 51 when comparing dexmedetomidine with traditional sedatives. Additionally, Xia et al 47 compared dexmedetomidine with propofol and also found no difference in mortality. Fraser et al 52 compared benzodiazepines with non-benzodiazepines (dexmedetomidine or propofol) and found no difference in mortality. We did not identify any systematic review or semisystematic review assessing the effects of sedatives on risk of serious adverse events. When assessing the effect of prophylactic use of alpha-2-agonists compared with alternative sedatives on the subsequent risk of delirium (table 2), the systematic review (on dexmedetomidine)46 and three semisystematic reviews (two assessing dexmedetomidine52 53 and one overall alpha-2-agonists48) did not find evidence of an effect. We did not identify any systematic review or semisystematic review assessing quality of life. We did not identify any systematic review or semisystematic review assessing cognitive function. Twenty-three additional outcomes (mainly) on the effect of dexmedetomidine versus other sedatives were reported by the systematic review and semisystematic reviews (supplementary material table 3). We did not identify any systematic review or semisystematic review assessing the effects of cholinesterase inhibitors for the prevention of delirium. We did not identify any systematic review or semisystematic review assessing the effects of opioids for the prevention of delirium. We did not identify any systematic review or semisystematic review assessing the effects of melatonine or melatonine inhibitors for the prevention of delirium. We did not identify any systematic review or semisystematic review assessing the effects of antipsychotics (eg, haloperidol) for the management of manifest delirium (table 2). Of all 378 included reviews, 227 (60%) stated that haloperidol was indicated for the management of delirium, 43 (11%) stated that haloperidol was contraindicated and 108 (29%) did not state whether haloperidol was indicated or not. We did not identify any systematic review or semisystematic review assessing the effects of sedatives for the management of manifest delirium. We did not identify any systematic review or semisystematic review assessing the effects of cholinesterase inhibitors for the management of manifest delirium. We did not identify any systematic review or semisystematic review assessing the effects of opioids for the management of manifest delirium. We did not identify any systematic review or semisystematic review assessing the effects of melatonine or melatonine inhibitors for the management of manifest delirium. This overview addresses the evidence for the prevention of delirium and management of manifest delirium with pharmacological agents in ICU patients. We identified only one systematic review46 out of a total of 378 reviews which addressed this topic. We classified eight as semisystematic reviews47–53 and 369 as narrative reviews. We only found the systematic review to have overall low risk of bias; all eight semisystematic reviews had overall high risk of bias. The identified systematic review with low risk of bias included seven randomised clinical trials55–60; which all had overall high risk of bias. Our main results are summarised in the Summary of findings table (table 3). This overview of reviews has several methodological strengths. We conducted a comprehensive literature search to identify reviews and meta-analyses in six major electronic databases, with specifically designed search strategies with no limits to publication year, type of publication or language. We used a transparent and systematic method, which was registered and published before the initiation of this project. Each phase of the screening, data extraction, data collection and methodological evaluations were performed by independent review authors working in pairs. This overview of reviews also has methodological limitations. First, we chose PRISMA as the gold standard for defining a systematic review. One may argue that it is difficult for older reviews to adhere to the PRISMA statement, as this was published in 2009. One may also argue that there may be PRISMA criteria that might not be as important as others, for example, a structured abstract. In contrast, risk of bias evaluation in individual trials is of huge importance for the conclusion of the review.64 Therefore, we chose pragmatically to classify all reviews, failing on a maximum of two PRISMA criteria, as semisystematic reviews. Second, we did not search for individual trials to perform a systematic review with meta-analyses and trial sequential analysis within each of the groups of pharmacological agents. Unfortunately, our results revealed that no systematic review on delirium management with any pharmacological agent has been published. Thus, we cannot discuss the evidence on pharmacological prevention or management strategies based on published trials, but merely according to the published reviews. Current research within delirium is challenged by methodological and clinical limitations. The main limitations revealed by this overview of reviews is the overall high risk of bias found both in all the semisystematic reviews and all the included trials. It is therefore likely that we purport results that are also biased, that is, beneficial results may be overestimated, and harms may be underestimated.64–66 In addition, we found a significant limitation to the research in the ICU delirium field, as systematic reviews adhering (or largely) to the PRISMA criteria all examined dexmedetomidine, which therefore dominates the current literature on pharmacological agents for delirium. Furthermore, the mechanisms of delirium are still not fully established and the underlying cause of delirium in medical ICU patients may be different from those in postoperative ICU patients, suggesting different optimal prevention and management strategies in the mixed ICU population. Certain subgroups of patients with delirium and risk factors at baseline (eg, age, severity of illness, exposure to a surgical procedure, cognitive dysfunction) may influence patient-centred outcomes differently. Current published trials have not stratified according to these factors but may in future research add new knowledge to the ICU field. Another important consideration is that many so-called placebo-controlled trials are not truly placebo-controlled, as some trials include rescue medications like haloperidol ‘as needed’. 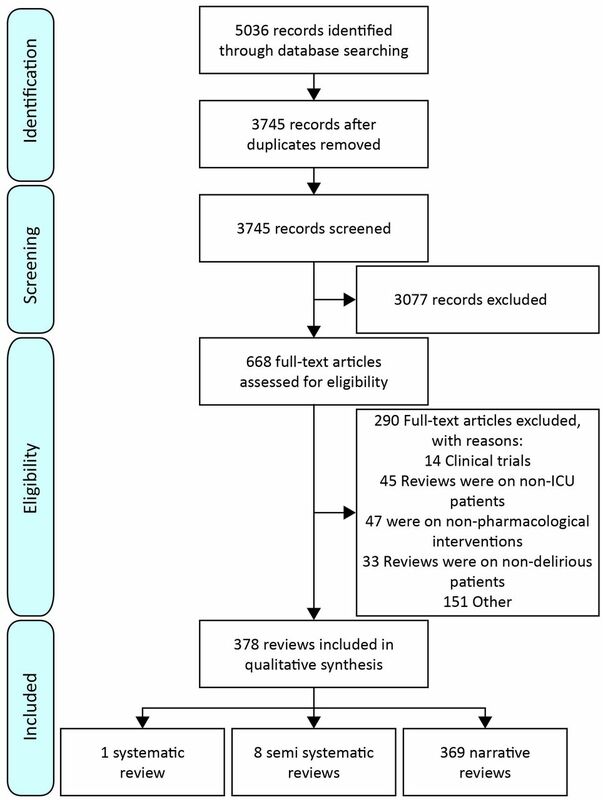 No study has previously attempted to systematically collect and evaluate all published reviews within pharmacological interventions for delirium. We found that narrative and non-systematic reviews dominate the literature on pharmacological interventions for delirium. Our findings confirm the observations by Siontis et al 67 that publications of erratic quality are produced in massive scales, in publications on the same topic, making it difficult to quickly get an evidence-based insight and overview. Our results reveal that many reviews cite trial results uncritically, leaving readers with the impression that, for example, haloperidol is a proven suitable pharmacological agent for the management of manifest delirium. Rapid access to current research to ensure evidence-based decision making and practice is increasingly demanded by the healthcare system, but guideline developers and decision makers are likely to be overwhelmed by the high numbers of published reviews of erratic quality. Our overview of reviews demonstrated that systematic reviews and semisystematic reviews currently available in the delirium literature are heterogeneous in quality with high risk of bias. The results were conflicting regarding the effect of dexmedetomidine for the prevention of delirium based on the high-quality systematic review and the semisystemtic reviews. There is no evidence for the use of any pharmacological agent for the management of manifest delirium based on systematic or semisystematic reviews. There is an urgent need for a systematic review with low risk of bias assessing the effects of pharmacological prevention of delirium and management of manifest delirium in ICU patients. Especially the effects of haloperidol need to be assessed, because haloperidol is the most recommended drug for the management of delirium. Future systematic reviews should aim to adhere to the PRISMA statement, so risk of systematic errors is minimised, and the best available evidence is presented. Furthermore, future trials on any antidelirious agent should report on patient-centred outcomes. Identifying the most effective intervention for both the prevention of delirium and management of manifest delirium in ICU patients will benefit patients, relatives and healthcare systems around the world. In our published protocol which was written a priori initiation of the overview, we stated that we would categorise reviews into the following groups: (1) systematic reviews according to PRISMA with low risk of bias assessed with ROBIS; (2) systematic reviews according to PRISMA with high risk of bias assessed with ROBIS; and (3) non-systematic reviews according to PRISMA. Because we only found one systematic review fulfilling all the PRISMA criteria, we decided post protocol publication to acknowledge reviews almost fulfilling the PRISMA criteria by adding the category semisystematic reviews. We thank Dezhao Kong, Ning Lianhg, Di Wang and Sainan Fang for helping with the translation of the Chinese reviews. American Psychiatric Association. Practice Guidelines for the treatment of psychiatric disorders, 2006.
. Detection, prevention and treatment of delirium in critically ill patients. Intensive Care Society 2006 http://members.ics.ac.uk/AsiCommon/Controls/BSA/Downloader.aspx?iDocumentStorageKey=d616cece-070a-48a4-bfaa-18da5a546634&iFileTypeCode=PDF&iFileName=Detection,%20Prevention%20and%20Treatment%20of%20Delirium (Accessed Mar 2018). British Geriatrics Society. The prevention, diagnosis and management of delirium in older people - National guideline. 2006 https://www.rcplondon.ac.uk/guidelines-policy/prevention-diagnosis-referral-and-management-delirium-older-people (Accessed Mar 2018).
. Managing delirium in Intensive care. Intensive Care Medicine 2009;35(1 supplement):s258.
. A multi-center characterization of antipsychotic use for the treatment of delirium in medical ICU patients. Pharmacotherapy 2011;31:421e. Dansk Selskab for Anæstesi og Intensiv Medicin (DASAIM). Sedationsstrategi - Målrettet behandling af gener forbundet med kritisk sygdom. 2014 https://www.google.dk/url?sa=t&rct=j&q=&esrc=s&source=web&cd=1&ved=0ahUKEwjkz_yS4cXOAhWF1iwKHQySCpMQFggcMAA&url=http%3A%2F%2Fwww.dasaim.dk%2Fwp-content%2Fuploads%2F2015%2F09%2FSedationsstrategi-sept15.pdf&usg=AFQjCNF9xGfr3aoeEBMTTPHrDpBm2BqMSw&cad=rja (Accessed Mar 2018). International Council for Harmonisation of Technical Requirements for pharmaceuticals for human use (ICH). Guideline for Good Clinical Practice E6(R2), 2016. Veritas Health Innovation. Covidence systematic review software. Melbourne, Australia, 2018. https://www.covidence.org/. (Accessed Mar 2018).
. A combined protocol for dexmedetomidine used in prolonged sedation in intensive care unit. Modern Medicine Journal of China 2012;14:20–2.
. Prophylactic consecutive administration of haloperidol can reduce the occurrence of postoperative delirium in gastrointestinal surgery. Yonago Acta medica 1999;42:179–84.
. An open trial comparing haloperidol with olanzapine for the treatment of delirium in palliative and hospice center cancer patients. Journal of Internal Medicine of Taiwan 2008;19:346–54. Food and Drug Administration (FDA), 2005. https://www.google.dk/url?sa=t&rct=j&q=&esrc=s&source=web&cd=1&ved=0ahUKEwjJ-6eB07nQAhVF1xoKHXJyCP8QFggcMAA&url=http%3A%2F%2Fwww.accessdata.fda.gov%2Fdrugsatfda_docs%2Flabel%2F2008%2F015923s082%2C018701s057lbl.pdf&usg=AFQjCNGbdzQFtVi2X5DcDmVDGRFmnujVYQ&cad=rja (Accessed Mar 2018). Contributors Coordinating the review: MB. Conception and design of the review: MB, JCJ, AP, JW. Performing search strategies and literature searches: MB. Performing the literature screening: MB, SRK, LKL, MOC. Performing the data extraction: MB, SRK, LKL, MOC. Writing the review: MB, JW, JCJ, AP, MOC, LKL, SRK. All authors critically reviewed and revised the manuscript and approved the final version for publication. MB is the guarantor of the review. Funding MB, MOC, JCJ, AP and JW were supported by the public Innovation Fund Denmark (4108-00011B), which did not have any role in study design, data collection, data analysis, data interpretation or writing of the report. No other sources of financial support were obtained for this review. Competing interests MB, MOC, JCJ, AP and JW had financial support from the public Innovation Fund Denmark; AP is head of research at the Dept. of Intensive Care unit at Rigshospitalet. The department receives support for research from CSL Behring, Fresenius Kabi and Ferring Pharmaceuticals. AP and JW are members of the AID-ICU steering group (NCT03392376); no other relationships or activities that could appear to have influenced the submitted work.